There is something so cool about living in or near a city with minor league sports. It is uasally easier to get tickets, which happen to be far more affordable. The atmosphere is usually more festive and the hot dogs and nachos taste just as good as they do in the big leagues. You get to see the big sausage race, the mascot and kids are always a big part of the game from yellin “play ball” to on field in game promotions.. If you live in one of these cities you also understand that a couple times a year you might be treated to major league talent coming to your town on a rehab assignment. Over the years I have been lucky enough to see Brett Saberhagen in Lowell Massachusetts, I watched Jason Veritek catch a few innings in Pawrucket and in 2010 I had seats for a Jacoby Ellsbury rehab game here in Portland. With all of those outings I witnessed, I really can’t tell you how the player performed. Sure there are numbers, but on a rehab it’s not about the numbers so much, it’s about working towards a bigger goal, getting back to Fenway. But today is something very different and very exciting as Dice K takes the hill at Hadlock Field. The Sea Dogs attendance has averaged 4,178 so far this season, but today Hadlock is full to capacity at 7,368. Fourty eight degrees and windy at gametime did not keep anyone away from this one, I guess that it has something to do with the sensation that is Dice K. Of the 25 or so media members here in the press box I would say that more than half are from Japan. Our little city is dealing with something global today. I am sure that this is just another stop, just another workout for Dice K. He was expected to throw about 70 pitches. And there are plenty of interested observers in the stands. Cameras are popping and fans applaud as he approaches the dugout. For most of these fans this is as close as they will get to Fenway, be it the economy, the ticket demand or the sheer distance to Boston. So when one of these players comes the fans feel closer to the big Leagues. With a big leaguer on the mound for the home team it is very interesting that the crowd is more involved when their team is on defense, the crowd cheered its way through a 16 pitch top of the first. I guess it didn’t hurt that all 16 pitches were for strikes in a 1-2-3 inning. On the day Dice K threw 74 total pitches, 44 for strikes in four and two thirds innings. He left to a standing ovation and a tip of the cap to the capacity crowd. The Sea Dogs won today, on the field, at the gate, at the concession stands and in the crowd as for one day our small city was the center of Red Sox Nation. 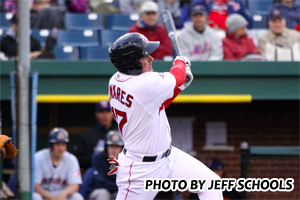 It was a cold night at Hadlock Field as the Sea Dogs and Reading Phillies opened up a 3-game series. However, the temperature wasn't as cold for Sea Dogs fans as Miguel Abreu's ninth inning home run was. The Phillies' 3rd baseman scored the team's first run and did all the work to score their last, as Reading beat Portland 5-4. Stolmy Pimentel made his first start of the year for the Sea Dogs after being activated from the disabled list earlier in the day. Pimentel had a rough go of it in his short stint with Portland early last season, but looked like a totally different pitcher in his first start this season. A fastball that hit 95mph and a slider in the low 80s led to 4 strikeouts for Pimentel in his first two innings of work. Then he faced Abreu to lead off the third, and the tall righty ran into trouble. After getting the next better to ground out, Pimentel allowed four straight base hits to give Reading a 3-2 lead. Pimentel would then get bailed out by a nifty double play on a grounder to 3B Kolbrin Vitek to get out of the jam. Pimentel would then strikeout 3 more batters over his final two innings before being lifted after throwing 73 pitches. The Sea Dogs took an early 2-0 lead in the second inning, thanks to back to back 2-out doubles by Bryce Brentz and Reynaldo Rodriguez. Heiker Meneses looped a single to right to score Rodriguez. The Sea Dogs would tie the game up 3-3 in the fourth, as Brentz smacked a double that just barely stayed in the yard, and scored on an RBI single by Dan Butler. Juan Carlos Linares would give the Dogs back the lead in the sixth with a lead-off home run, his 4th of the season. The Phillies would tie the game up in the eighth with a little help from a fielding error by Brentz in the outfield. After Jeremy Hazelbaker gunned down Cesar Hernandez at 2nd trying to stretch a single into a double, Brentz misplayed a liner into the right field corner by Darin Ruf, allowing Ruf to get into scoring position. Stephen Susdorf then made Brentz and the Sea Dogs pay, dropping an RBI single into shallow center for the game-tying run. Aaron Kurcz looked primed to get his team into the bottom of the ninth with the game still tied, striking out the first two batters of the inning. Abreu had other plans, drilling the eventual game-winner into the Sea Dogs bullpen in right field. For good measure, Kurcz got Troy Hanzawa to strike out looking to end the inning. The Sea Dogs then went down 1-2-3 in the bototm of the ninth as Justin Friend earned his 4th save of the season. Pimentel's final line was 5 innings, 7 hits, 3 runs (2 earned), with 6 strikeouts and no walks. It was a striking difference from the pitcher that struggled in Portland in 2011. Brock Huntzinger came out of the bullpen for the first time for the Sea Dogs after starting 4 games this season. Huntzinger needed only 17 pitches to get through two hitless relief innings, although he did walk a batter. Jordan Whatcott picked up the win for Reading, giving up 3 hits with no runs, and striking out two. Daisuke Matsuzaka will make a rehab start for the Sea Dogs tomorrow afternoon, as he tries to make it back to the Red Sox after having Tommy John surgery last year. Matsuzaka also made a rehab appearance for the Sea Dogs in 2009, but it was on the road in New Hampshire. Another major leaguer is scheduled to pitch in Portland on Monday, as former Yankee and Astro great Andy Pettite is in line to start for Trenton. Pettite is trying to make it back to the Yankees after a brief 1-year retirement from baseball last year. Juan Carlos Linares got the Sea Dogs started off on the right foot, hitting the first pitch he saw from the lead-off spot for a home run, but the Dogs' bats did little after that. Collin McHugh pitched into the 7th inning for the Binghamton Mets, as they spoiled the Sea Dogs home opener with a 5-1 win. Portland starter Brock Huntzinger got two quick outs in the top of the first, but ran into trouble after that. The righty gave up 2 hits and 2 walks to the next four batters as the Mets held an early 2-0 lead. Linares sought to get the Sea Dogs offense rolling early, knocking the first pitch he saw just over the wall in center. The Dogs would load the bases after 3 of the next 4 batters collected singles, but McHugh shut the door to end the rally. McHugh settled down the rest of the way, allowing only three baserunners over the next 5 innings before being pulled with two outs in the 7th with 2 men on. The mets got to Huntzinger again in the 3rd inning, as Josh Rodriguez' 2-run double finished off a 3-run inning for Binghamton. Huntzinger would only last four innings before being pulled with 71 pitches thrown. Jeremy Kehrt pitched beautifully in relief of Huntzinger. The righty reliever allowed just one hit over four innings, while striking out 5 and walking 2. There was some bright spots for the Sea Dogs, as 3 of their young prospects all collected hits. Derrik Gibson picked up a single in only his second game of the year, and Bryce Brentz and Kolbrin Vitek also picked up hits. All 3 players are in the Top 25 prospects in the Red Sox organization. The win was McHugh's first of the season, as he went 6.2 innings, allowing just 1 run on 7 hits, with 6 strikeouts and no walks. Huntzinger fell to 0-2 and has a robust 11.57 ERA after just two outings. The second game of the series is tomorrow night as Left-hander Chris Hernandez looks to get the Sea Dogs their second win of the season. The Reading Phillies (2-0) opened the 2012 season by sweeping a doubleheader from the Portland Sea Dogs (0-2) at First Energy Stadium in Reading, Pennsylvania. The Phillies collected a 4-2 extra inning victory in game one and 7-4 win in game two. Reading got on the board first when Sebastian Valle tagged Portland starter Chris Balcom-Miller with a solo home run to left field as the Phillies took a 1-0 lead. Valle's home run would be the only damage against Balcom-Miller who held the Phillies to one run on three hits over five solid innings of work. Balcom-Miller only threw 48 pitches, striking out three and did not surrender a walk. Portland tied the game at one in the fourth inning when Oscar Tejeda collected a two out RBI single scoring Reynaldo Rodriguez. The score remained tied until the top of the seventh when Ryan Dent hit a two out sole home run to give the Sea Dogs a 2-1 lead. Dent would lead the Portland offense with a three hit performance (3-for-3, RBI, R). The Phillies rallied against Portland reliever Aaron Kurcz in the bottom half of the seventh loading the bases with nobody out. Jiwan James hit a sacrifice fly to center scoring Michael Spidale to tie the game sending the season opening contest into extra frames. Portland reliever Caleb Clay surrendered the two run homer to Castro in the ninth to give the Phillies the dramatic victory in game one. Clay (0-1) suffered the loss allowing two runs on three hits in 1.1 innings. Michael Cisco (1-0) earned the win for Reading holding the Sea Dogs to one hit over one inning of work. Butler and Peter Hissey. Kolbrin Vitek was 2-for-4 in his Double-A debut. Game two got off to a great start for the Sea Dogs as Juan Carlos Linares led-off the game with solo home run to left off Reading starter Tyson Brummett to give the Sea Dogs a quick 1-0 lead. Brummett would settle down to retire the next nine batters before giving way to reliever Chris Kissock in the fourth. Kissock (1-0) would earn the win holding the Sea Dogs to one run on three hits in 2.1 innings. making his first Double-A start for the Sea Dogs, allowed four straight batters to reach to start the third inning. Cesar Hernandez drove home Steve Lerud and Miguel Abreu with a double to left giving the Phillies a 2-1 lead. Steve Susdorf added a RBI single to right scoring Spidale and Hernandez scored on a Tug Hulett ground out as Reading took a 4-1 lead. Hernandez was 2-for-4 with two doubles, two RBI, and a run scored to lead the Reading offensive attack. four innings on the mound. He struck out four and walked two. Spidale would add a RBI single in the fourth and Castro a RBI single in the fifth as Reading stretched their lead to 7-1. Portland would make the game interesting plating a run in the sixth and two in the seventh bringing the tying run to the plate. Justin Friend would get Matt Spring to pop-up to end the threat and earn the save. pick-up his first Double-A RBI with single scoring Heiker Meneses in the seventh. The Sea Dogs and Phillies are back in action on Friday night at 7:05 PM. The Sea Dogs will send right-handed pitcher Brock Huntzinger (0-0, 0.00) to the mound. Reading will counter with righty Trevor May (0-0, 0.00). Media Day LIVE From Hadlock! 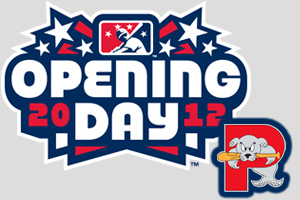 The 2012 Portland Sea Dogs arrive in town Tuesday and the Maine Sports Network will be there! Starting with Calling All Sports from 10A-Noon Lee Goldberg and Jeff Schools will broadcast LIVE from Hadlock. You can listen on AM870/1470 WLAM, stream at MaineSportsNetwork.com and on your smartphones, download the TuneIn Radio app and search Maine Sports Network. Then at 3:15PM, Media Day starts and MESN will bring you complete coverage. We will be streaming audio AND VIDEO LIVE from the Clubhouse. We will bring you coaches and players, have photos and exclusive audio from your 2012 Portland Sea Dogs. Baseball season is HERE!! See you at the ballpark! 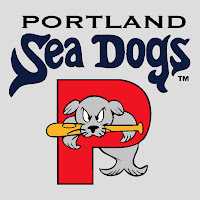 The Portland Sea Dogs announced today that the University of Maine Baseball team will play a game at Hadlock Field this coming season. The Black Bears will take on Boston College on Tuesday, May 15th at 6:00 PM. A rain date has been set for Wednesday, May 16th. 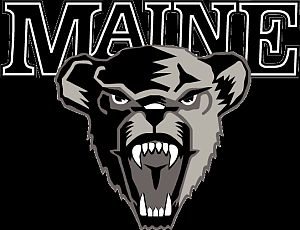 While the Black Bears routinely play a game in southern Maine, this will be their first time at Hadlock in over a decade. UMaine last played at Hadlock in 1998, when they faced off against UMass. UMaine Baseball Coach Steve Trimper was on hand for the announcement, as was fifth-year senior Justin Leisenheimer. Leisenheimer, a part-time outfielder joked about how he's had to face some big outfield walls, but nothing compared to the 37-foot Maine Monster in Hadlock's left field. For two Black Bears, it will be a return to their high school playing days. Freshmen Sam Balzano of Deering and Scott Heath of Westbrook both played games at Hadlock during their high school careers. Last year the Black Bears won the America East Championship and defeated #20 Florida International in the Chapel Hill Regional. Trimper and the Black Bears will look to repeat this season, with 7 returning starters. As the calendar turns from 2011 to 2012, so does the baseball calendar. The 2011 edition of the Red Sox was not what you would call a success, but the promise of a better 2012 season is on the horizon. The Portland Sea Dogs held their annual Hot Stove Dinner to talk about the upcoming Red Sox and Sea Dogs seasons. As usual, there were some big names on hand. 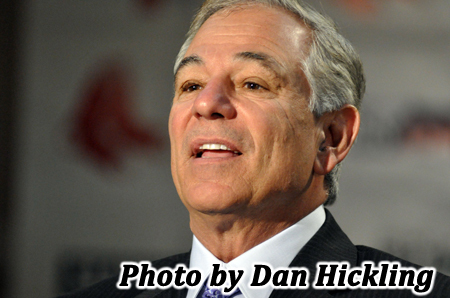 New Red Sox manager Bobby Valentine was the main draw, but also on hand were Red Sox Catcher Jarrod Saltalamacchia and Seattle Mariners pitcher Charlie Furbush. Furbush, for all of you who live under a rock, grew up in South Portland and started his college career at St. Joe's before moving on to LSU and the major leagues. One theme among all 3 guests is that 2011 is in the rear-view mirror, and 2012 should be one hell of a ride.